Eatonton is becoming technology savvy by adding an app to download on smartphones that is completely free. The app, called distrx, allows users to view what is happening and what is available in downtown Eatonton. The app, for Android and Apple users, can be found by typing “distrx” into the App Store on a smartphone. Once downloaded, participants can login through Facebook or register with an email address and password. While developing the app, the creators thought about why people in Eatonton would need an app about Eatonton since those who live in the town already know the town. Distrx isn’t just for Eatonton; it’s for travelers across the country and can be used anywhere by anyone who has registered. 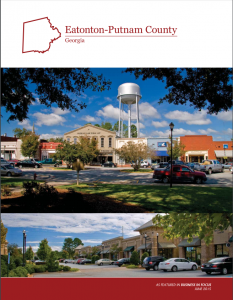 “A lot of communities like Eatonton and across the United States decided what we need is our own mobile app, but who is going to download an Eatonton app? Developing an app is extensive and takes time, but we developed one app that is location aware,” said Ron Cook, distrx developer. The app is free for users, and costs only $10 a month for any business that wants to be listed on it, Simpson said. The fee may be paid monthly or annually. Through the app, users receive the businesses’ web page, pro­motional offers and notifications. Currently, no Main Street organi­zation pays for the app, Simpson said. Cook and Simpson are always looking to improve the app, which took six months to develop. It was tested in seven states so they could listen to what people and businesses wanted.